Mailman School graduates pursue their passions across a broad range of employment sectors. While most choose to apply their skills and experience in and around the New York metropolitan area, our alumni can be found working throughout the United States and abroad. View a partial list of employers and recruiters. 376 graduates reported salaries. 11 part-time salaries and 8 international currency salaries were excluded (therefore, n=358). The Overall Average salary was: $77,000 (for those with no prior graduate degree, $65,860). The Overall Median salary was: $65,000 (for those with no prior graduate degree, $62,000). 59 graduates (15.7% of those answering this question) reported received signing bonuses, relocation, or education benefits. The average signing bonus was $11,262and the median was $5,000. Specific benefits/bonuses mentioned included tuition remission, stock options/equity, licensure reimbursement, visa sponsorship, housing and transportation pay (especially for graduates working internationally), and relocation costs. Salaries differ by industry, years of experience of the candidate, geographic location, size of the employer, etc. The following salaries are school-wide salaries by industry. The first table is for all salaries reported; the second table is the average or median salary for those MPH or MS students who entered the Mailman School without a prior graduate-level degree (i.e. excluding Executive MPH, MHA, or MS students, PhD/DrPH students, and students who entered Mailman with a pre-existing MD, PhD etc.). The third table is MHA salaries. 516 students graduated with an MS or MPH and did not have a prior graduate degree. Of these, 280 reported salaries, of which 13 were excluded as paid in international currency or part-time. Graduates saw approximately a 32-44% increase in salaries after graduation as compared to the salaries they earned before entering the school. While the Mailman School has excellent career outcomes, and students and alumni have lifetime access to top-quality career services resources, students are ultimately responsible for taking ownership of their own job search. To find employment, students applied, on average, to 30 jobs in 2017, (excluding those who were recruited from internships or prior jobs). Students went through an average of 4.9 first-round interviews and 3.1 second-round interviews, to receive an average number of 1.6 job offers ((there were 2 students receiving more than 5 offers, 4 students receiving 5 offers; 7 students receiving 4 offers; 34 students receiving 3 offers; 106 students receiving 2 offers). 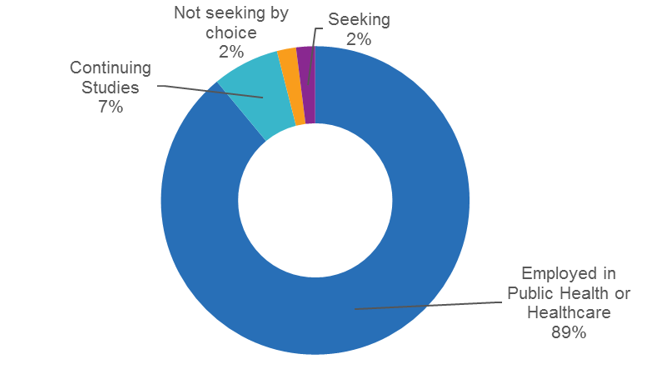 Students used a variety of search methods to hear about the jobs they ended up accepting. 22.2% of students used Career Services to find their job; 4.9% used Mailman School Alumni networking; 21.3% Department/faculty; 7.3% Classmate referrals, 6.1% practicum; 13.8% personal network; and 42.4% used a non-OCS Job Board or Other method; and 5.9% were promoted from an existing job. 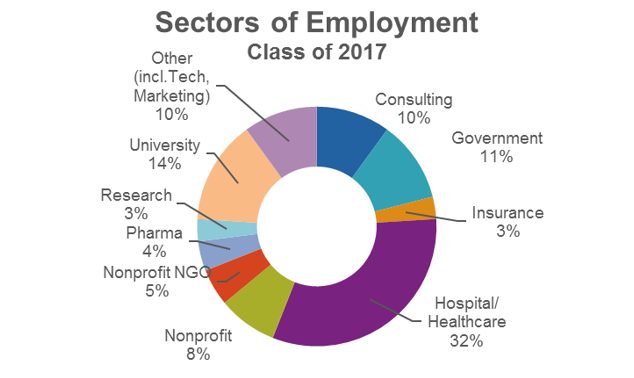 In all, approximately 60-70% of students found their jobs via networking; and 62.13% found their jobs with the assistance of Columbia’s Mailman School of Public Health. For further details, view the complete report.